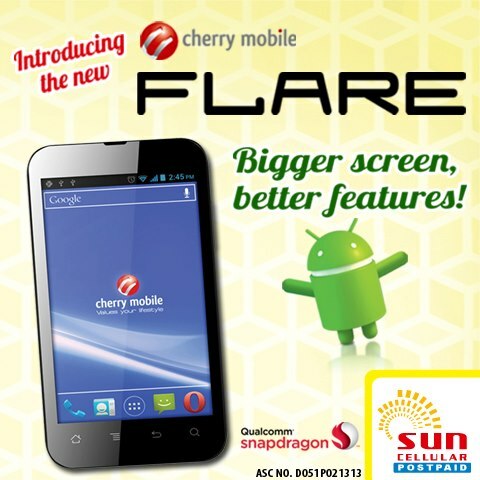 The popular Cherry Mobile Flare is now FREE at Sun Plan 350. This most sough-after handset has been in the public's eye since the last quarter of 2012; however, it is consistently sold out in most stores nationwide until now. If you're planning to have a budget-plan, you can have this dual-core handset for free with Sun Cellular! That's more convenient than going shop-hopping just to find the Flare phone. So for the uninitiated, Cherry Mobile Flare is the most successful local smartphone there is. It packs a capable 1.2GHz dual-core Snapdragon processor, 5MP camera and Android 4.0 (Ice Cream Sandwich). Aside from the free phone, the Sun Plan 350 is also bundled with unlimited calls and texts and 250 SMS to other networks. If you want to find out more of the CM Flare, check our review here.